Steaming a burger? Why would anyone do this? It’s crazy, right? Well… possibly when done incorrectly. One of the best burgers I’ve ever eaten in Boston is from Sunset Bar and Grill in Allston where they have over 100 beers on tap. That was the first time I’d ever had a beer steamed burger. The meat didn’t have grill marks on the outside, which is a key part of burgers for many people, but it was amazingly tender and flavorful. 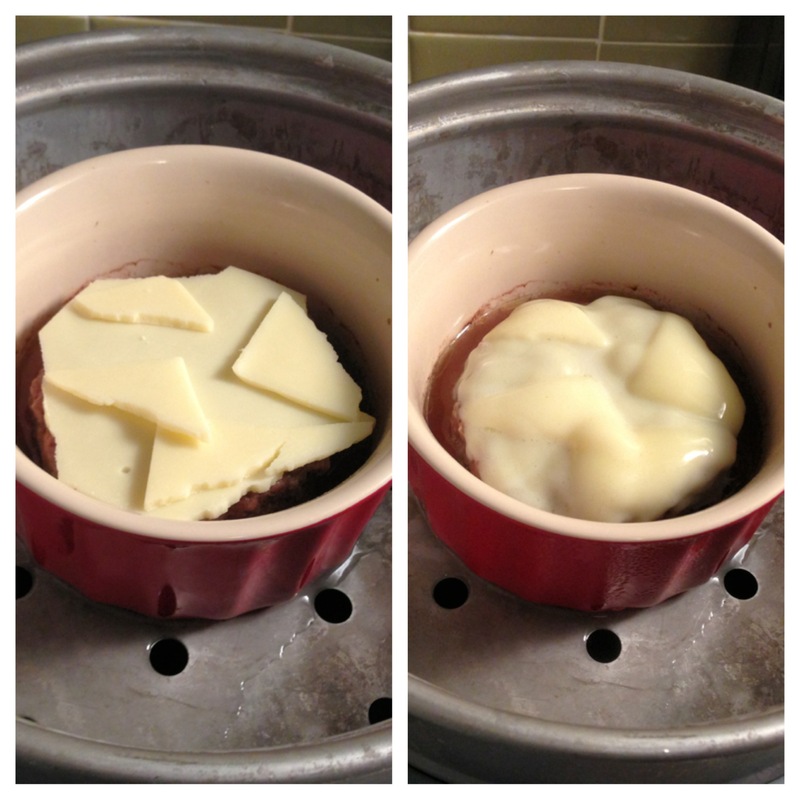 I like cheese on my burger and the cheese melts perfectly when using a steamer. Another restaurant made famous for its steamed burgers is Ted’s Restaurant in Connecticut where they’ve been making steamed burgers for over 50 years using a very unique process. I’ve haven’t been there yet, but it’s one of the few reasons I would like to visit Connecticut again. In an effort to re-create this masterpiece, I tried beer steaming a burger when I was in law school. I had two reasons for trying this out. The first reason was obviously a devoted pursuit of delicious flavor. The second reason is that anyone who has ever lived in an apartment with poor ventilation knows that grilling, frying, or charring anything means days of that smell lingering. I wanted a burger, but I didn’t want to pan fry one, which usually results in tough meat and a stinky apartment disaster. Unfortunately, I over-steamed the burger the first time with pure beer in a makeshift steamer of my own aluminum foil design, so the meat came out way too overcooked. The apartment did not, however, stink at all. One other plus that seems like a con at first glance is that a lot of the calorie-laden, but flavor packed fat cooks out of the meat. That means a less fatty burger, but the steaming means that the meat remains juicy (as long as you don’t overcook). As a second try, I used a rice cooker with a steamer attachment and used water “flavored” with bourbon (or beer, but you can also just use water). I also shortened the cooking time after some trial and error. The result was a tender burger with a lot of meat flavor and, once again, perfectly melted cheese. If you can get past the concept of a burger without grill marks, then you won’t be disappointed by this indoor-friendly burger. In hindsight, I may have used slightly more than 4 oz. of meat for this burger, which would explain it’s impressive height! Makes one Hamburger/Cheeseburger with 280 or 360 calories respectively. Note: I like to use lean beef for this burger because a lot of the excess fat cooks out anyway. Feel free to use fattier ground meat though if you’re skeptical about lean hamburger. Salt and pepper or other seasonings of choice like Adobo or onion powder or garlic powder, etc. Optional: Any other burger toppings you might want like ketchup, mustard, BBQ sauce, diced/caramelized onions, pickles, lettuce, sauteed mushrooms, etc. Optional: 3 or 4 ounces of cheap bourbon or half a light beer. Steamer. It can be a rice cooker with steamer attachment or a pot steamer system, or even just a jury rigged aluminum foil with small holes in it suspended over a pot of water with a lid. 14 oz. Ramekin or other wide shallow container. You can try using large, washed out, tuna cans or create a wide, shallow bowl out of aluminum foil (I’ve done this before and it works like a charm). Toaster/Toaster oven/buttered skillet if you want to toast your hamburger bun. Purchase 1/4 pound (4 oz.) fresh burger pattys or form your own pattys from a pound of ground beef. Season the meat however you would like. At a bare minimum season it with a little salt and pepper. For simplicity, I just used some Adobo Light Seasoning and mashed it into the patty I formed. Use your imagination because steaming a burger is also great for making stuffed burgers with ingredients on the inside. 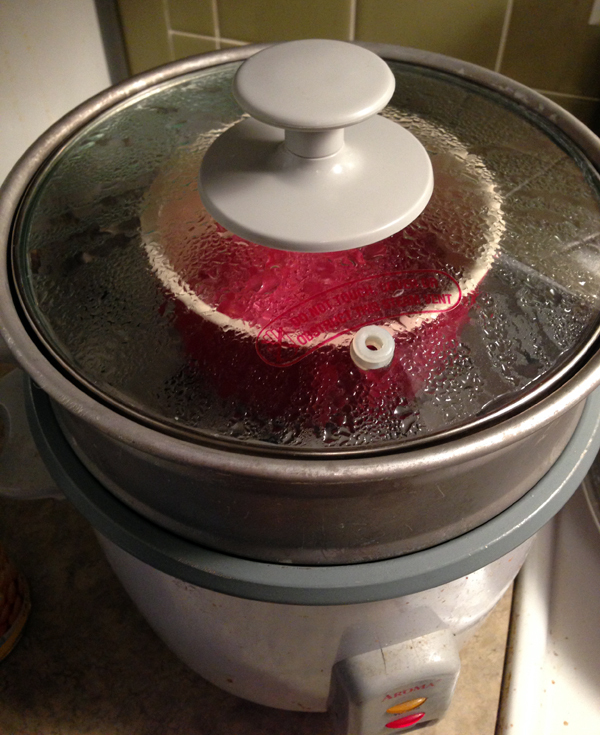 Add the water and turn on your steamer so that the water is at a low boil. At this point add in the bourbon or beer. This doesn’t affect the flavor hugely, but it does give the meat a nice aroma. 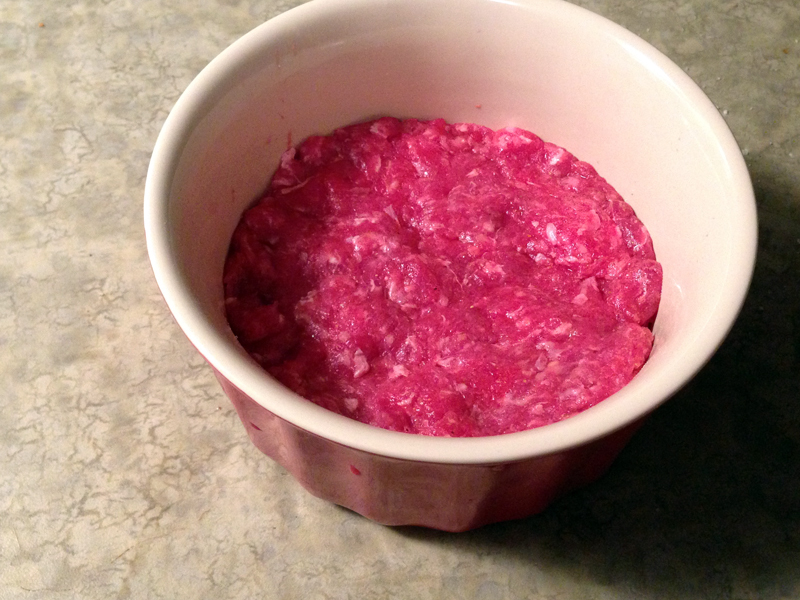 Put the meat into the ramekin so that it touches the edges. Make it fit properly, but don’t push down too hard or you’ll toughen up the meat. Place the meat-filled ramekin into the steamer and quickly cover it with the lid. Steam the meat for 6 minutes for medium-rare, 8 minutes for medium, and 10 minutes for well done. Those cooking times may vary per steamer. I know the burger looks a little sickly without a char on it, but it does taste ok. While the burger steams, toast your hamburger bun if you want. I find that the toasting helps minimize soggy burger buns. One minute before your burger is ready, add the cheese to the top of the burger and then cover the steamer with the lid again. Let the cheese melt, but be careful because if you leave the burger in there too long, the cheese will just liquify and slide off the burger. 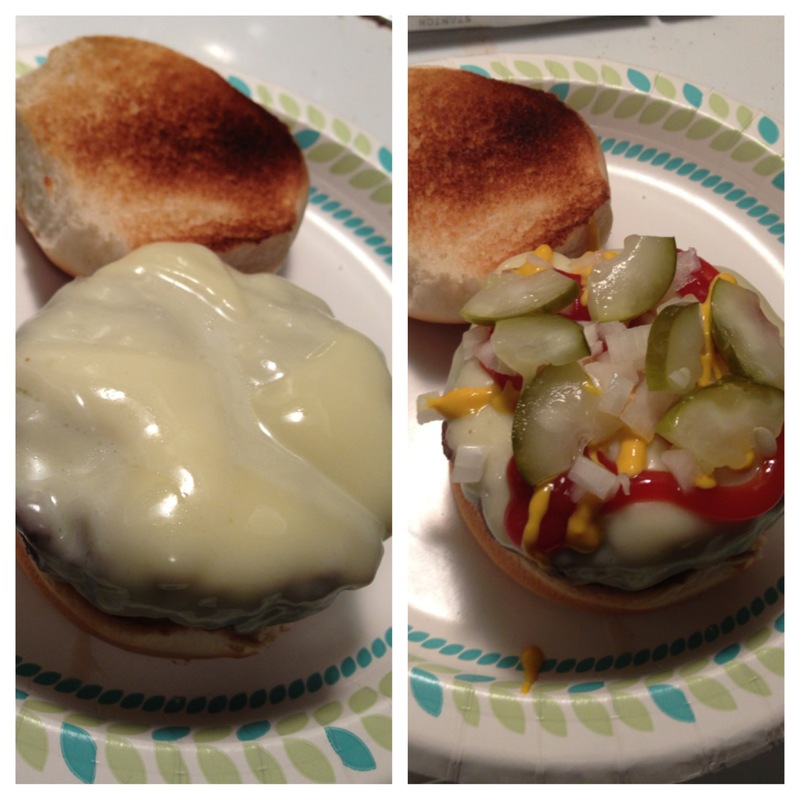 Remove the burger once the cheese has melted and place it on hamburger bun immediately. Top your burger with whatever toppings you want and enjoy! We’ve seen this and it does makes sense…and we never had a recipe. We will try this (we have the gear) and love playing with burgers. Very cool- thx! I’m glad you might try it out! Even if you don’t move over to steamed burgers (I like them, but grilled are obviously great), I think you’ll enjoy how different it tastes. Fascinating. I’ve never heard of this before but it does look really good. If you give it a try, I’d love to hear how it goes. It’s a very different burger! So interesting – I can’t wait to try this! Thanks for stopping by. I’d love to know how it goes when you try it! I’ve seen Ted’s Restaurant featured on TV and want to try their steamed burgers. I live on Plum Island in Mass, three people in 1000 SF so I can really appreciate stinking the house out when you want a burger. The wind HOWLS out here and I can’t grill throughout most of the winter. This winter, I discovered that I could steam (sort of) the burgers without the smell. It’s not a true steamed burger but it’s close, and it’s juicy and delicious. AND it does result in some color on the burger. Put a skillet on the stove, get it blazing hot. Put the burger in the pan, squirt some Worcestershire on top and cover it. Leave it for 3 minutes, then flip it, more W sauce on top, and put some other liquid in the pan, Guiness is really good. Cover the pan again for 3 minutes, the add cheese and cover for another minute. The house won’t smell, and the burger is really juicy, the steaming absolutely makes a tender juicy burger. Thanks for the tips! Sounds like a tasty burger! 1 Gallon = 4 Quarts / 128 Oz. 1 Quarts = 2 Pints / 32 Oz. 1 Pint = 2 Cups / 16 Oz. 1 Cup = 16 Tbsp. / 8 Oz. 1/2 Cup = 8 Tbsp. / 4 Oz. 1 Tbsp. = 3 Tsp. / 0.5 Oz. 1 Tsp. = 1/3 Tbsp. / 0.167 Oz. 4 oz. Grnd. Beef (90/10) = 200 Cal. 4 oz. Grnd. Beef (85/15) = 240 Cal. 4 oz. Grnd. Beef (80/20) = 280 Cal. 4 oz. Rib Eye Steak = 300 Cal. 4 oz. NY Strip Steak = 250 Cal. 4 oz. Steak Tips = 180 Cal. 5 oz. Chicken Breast = 150 Cal. 5 oz. Bnls. Chicken Thigh = 175 Cal. 4 oz. Pork Tenderloin = 130 Cal. 4 oz. Pork Chop = 160 Cal. 4 oz. Tilapia Fillet = 100 Cal. 4 oz. (113 g.) Shrimp = 120 Cal.